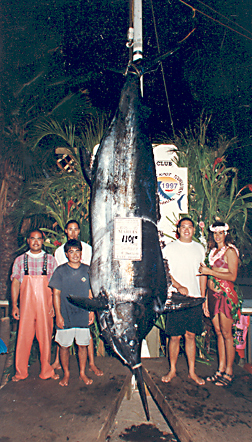 The was the second grander caught in one day during the Lahaina Jackpot. Fight time was five hours (the fish died and had to be planed up). The marlin had two 20-lb spearfish and a 15-lb mahimahi in its stomach when caught. It attacked a lure running from the center rigger of Capt. Rahn Yamashita's 30-foot Knife, the SHIRLEY Y.